Usually divided into two categories, natural floors which are made from living plants, including Linoleum. Synthetic floors are completely man made or manufactured from materials other than natural products such as Vinyl and Thermoplastics. Commonly used in areas like: Hospitals, Schools, Offices and Retail Stores. Resilient floors require regular stripping, sealing and dressing to maintain both their effectiveness and appearance. The most common type is concrete, which as a mixture of cement, sand and water, has a tendency to create dust problems if not properly sealed. 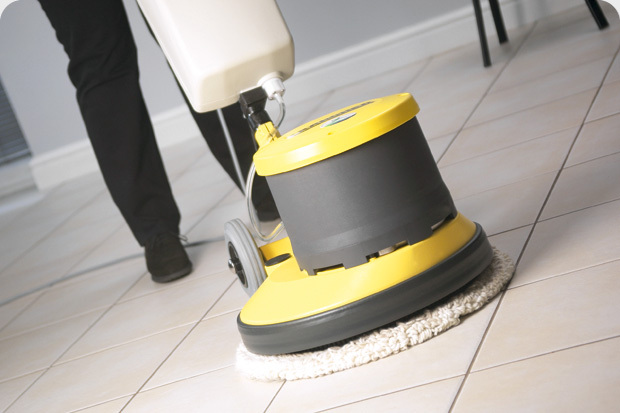 Often used in factory areas and industrial workshops, mops and buckets are no longer effective, giving way to specialist rotary cleaners to keep floors clean and grease free, reducing the risk of accidents.